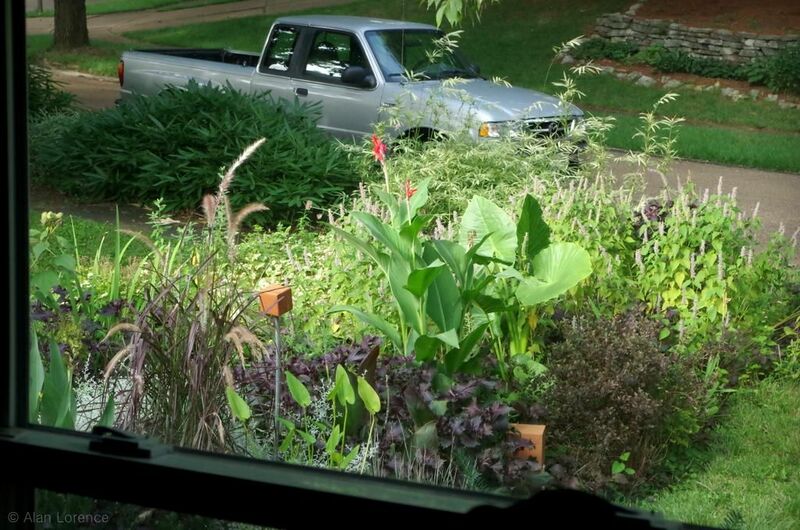 As I was sitting at the kitchen table eating breakfast -- Monday is the only day of the week that I can do this -- I realized that the view out of the front window from the kitchen is quite nice. 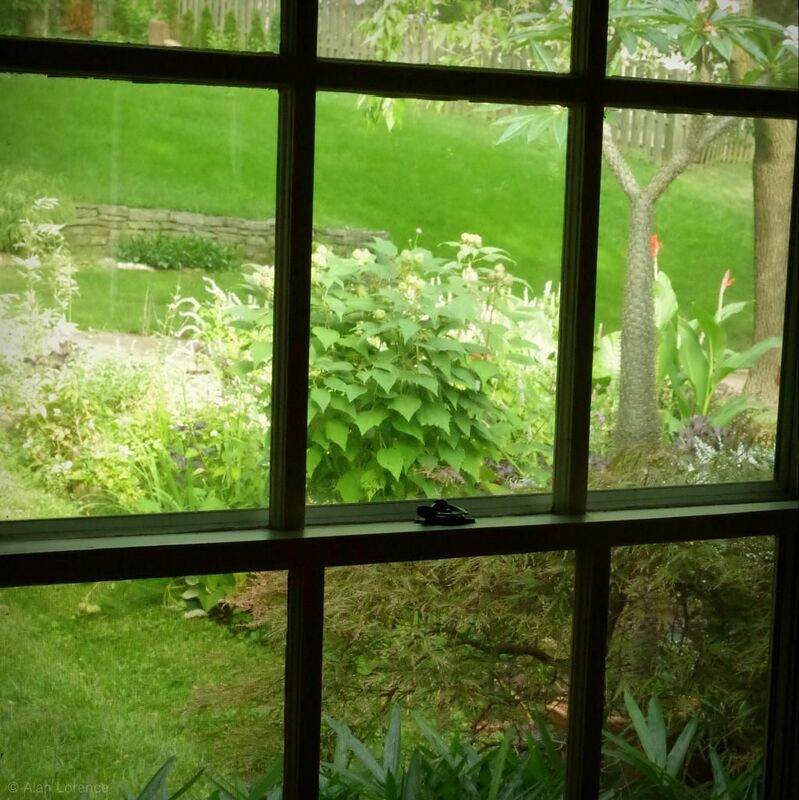 So I decided to show it and the other views of my garden from indoors. I like it! 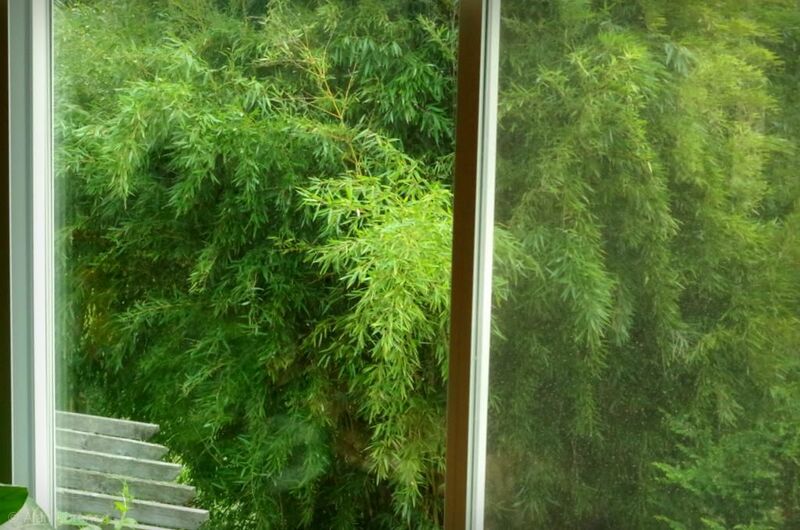 Glad I pruned that bamboo in front of the window -- it's the perfect height now! The bamboo and twisted white pine create the backdrop, but the annual vine steals the show. 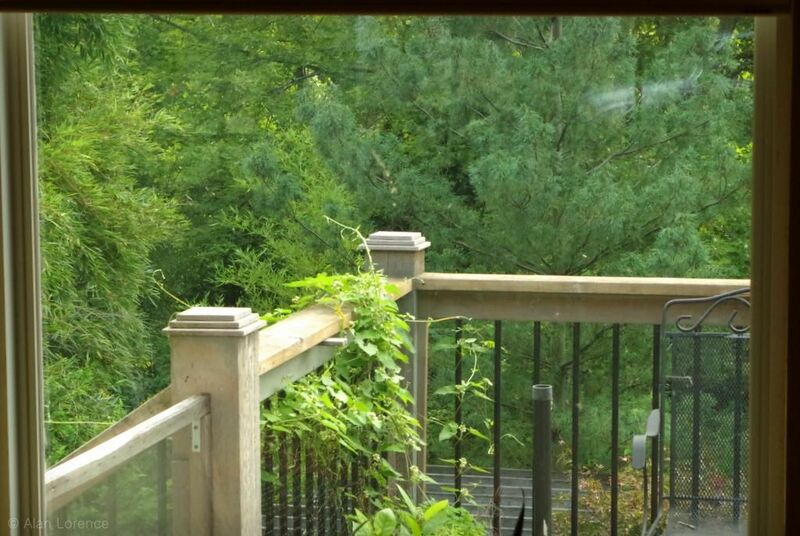 I kept deck plantings to a minimum (although that may change this week as I rearrange some things) so this greenery wrapped around the deck railing is so welcome! The castor beans seem to be larger than ever this year, already reaching almost to the deck railing. Those bananas too -- so tall! It's great catching glimpses of both from indoors! Just a wall of bamboo! The small birds (hummingbirds, chickadees, flycatchers) fly around this all day long, darting in, emerging unexpectedly. So much fun! The bamboos have leaning culms which I have not yet taken care of -- I like the way that they almost meet from the right and left! Just a sliver of the pond is visible, mainly because I did not plant castor beans at the corner of the driveway this year. I think that was a good choice. I've shown you this part of my yard more than any other this year I think, but it's so nice this year -- probably because I added more big-leaved tropicals. 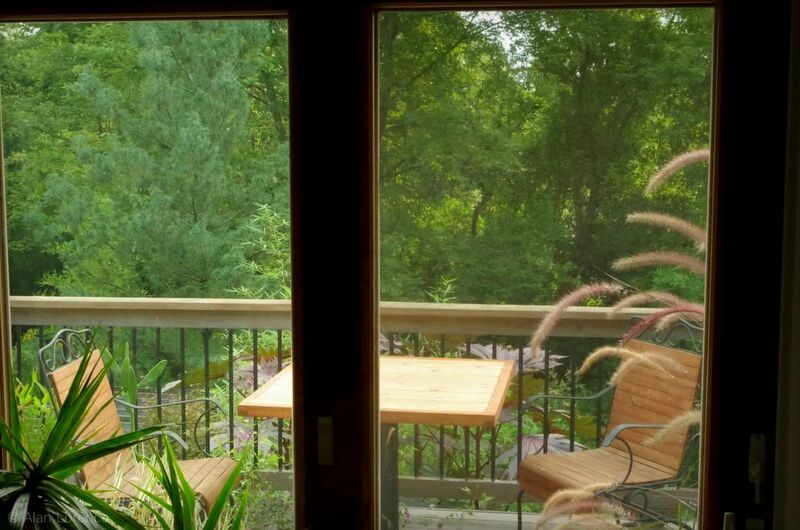 Do you have any favorite garden views from indoors? 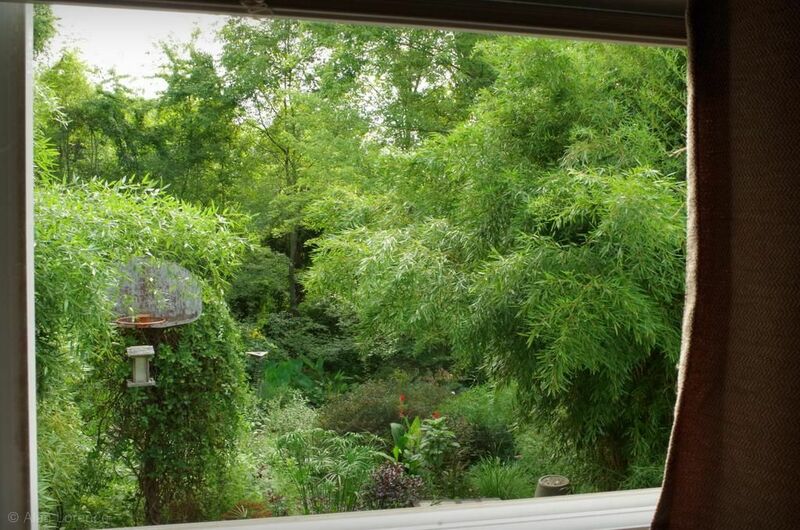 What delightful lushly green views you have. 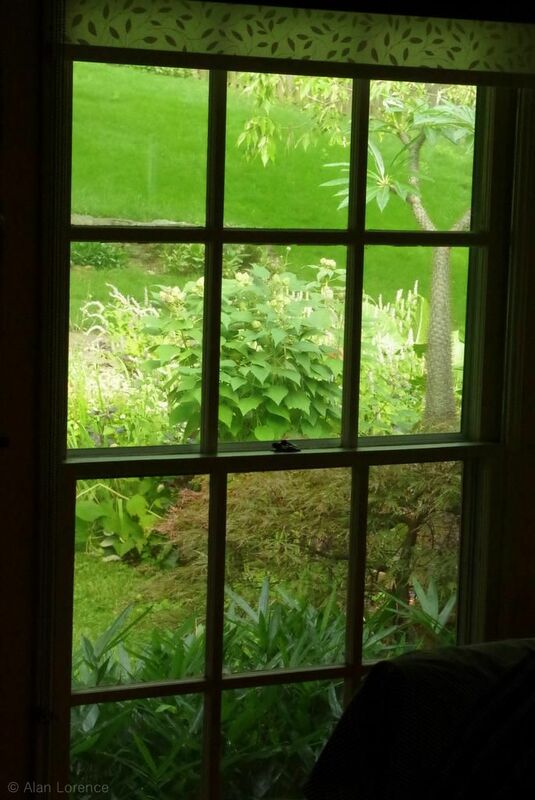 To my mind it is just as important to be able to have views from the inside of the house as the outside.Especially if you are working inside or it is too hot outside. 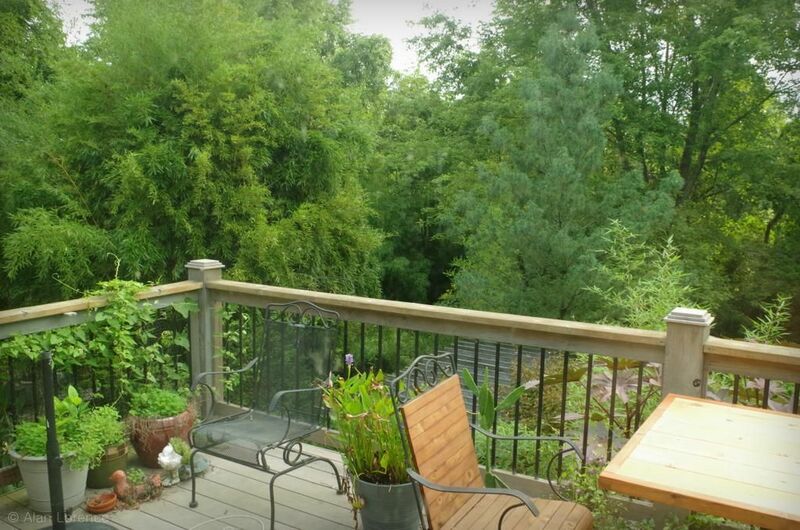 These views are so cool--and *green*. My views are mostly brown. Even what green there is has a yellow tinge, unlike your deep hues. But at least our heat is a "dry heat," ha ha. The views out or your windows are beautiful. Love your bamboo, castor beans, and banana plants. Very nice views from inside your house! Your pictures almost make me want to wash my windows. I leave them dirty so that the birds don't fly into them and hurt themselves not because I'm so lazy:) My favorite view of my garden is from a kitchen window that looks out over the pond so we can watch the fish playing while doing the dishes. Beautiful view! How do you get any work done sitting at your desk with all that beauty so close. 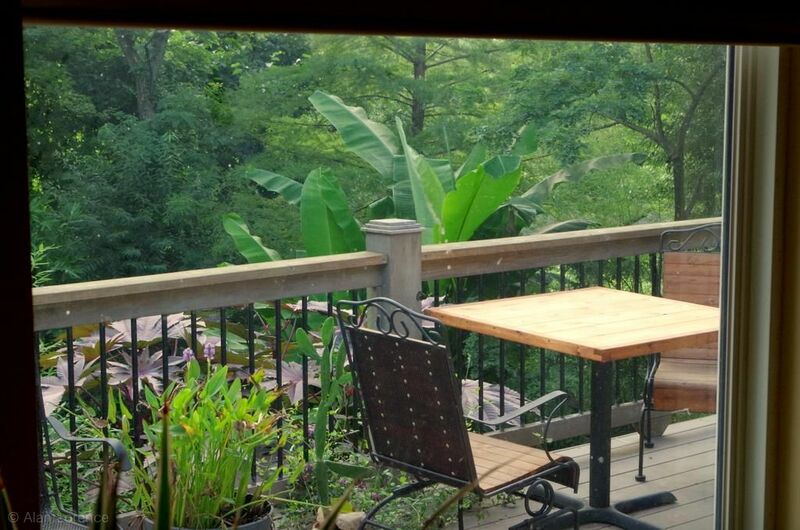 I'd be on that gorgeous deck all day! What is that tree featured in the first two pictures on the right-hand side? Jenny: Thanks! You have some wonderful views too. Gerhard: It's been a while since I've been out west, but I remember how shockingly green my garden seemed after even a week in more arid climates. Peter: Don't assume that my windows are clean! I also don't wash them often because of birds, and I wish I could see the fish from the house! Chavliness: The heat and humidity help my productivity. :) The tall spiky tree is my potted Pachypodium lamerei. It adds so much, doesn't it?